Sooooo, our new house has a secret passageway. Kind of. Ok so maybe it's just a closet that connects two rooms, but it's still really cool. And my own secret passageway. Humor me. Ta da! My secret passageway. But you're saying... wait, Michelle, that doesn't look like a secret passageway, that looks like a pantry. It is a pantry. Like I said, humor me. On the other side of our new Ikea island I shared in the kitchen tour earlier this week is a door that leads into an awesome-sized pantry. As you saw, we're lacking some storage in the kitchen, so this big ol' pantry really helps to store a ton of food and kitchen-y stuff. Now you can judge us on the amount of Kashi products and taco shells we eat. But if you walk through to the end of the pantry, it leads to another room. Ohhhh yeah, how cool is that? Now you find yourself in our laundry room! Well, laundry room slash mudroom slash garage slash basement slash workshop slash gardening room slash storage room slash sewing room slash craft room. Yeah, we've got a lot of expectations for this little room. David and I brought some metal shelves that we had in our basement at the old house (that the previous owner left behind, actually!) so we could do a lot of our storing vertically. Believe it or not, that's somewhat organized. These shelves hold some of David's most-used tools, cleaning supplies, laundry supplies, Tucker gear, outdoor entertaining stuff and other random items that we use regularly. We've also got an attic for storage, so we were able to put things like summer clothes and empty moving boxes up there. I looove how much natural light beams into this room, just like the kitchen! On the other end of the room, I was able to put our old old (read: two houses ago) kitchen table for more storage and for a folding space for laundry. Love it. And for those of you wondering, yes, there's a door from the room that leads back out to the main part of the house. You don't always have to use the secret passageway. Although you are cooler if you do. The thing about a room like this is that you could go wild with color and fun-ness. That's a word. Before we put our old house on the market, you may remember that we had big plans to make over our laundry room. It ended up getting a mini laundry room makeover, but I never got to inject the room with the fun-ness that I had planned. Helloooooo, new laundry room! Ready for fun-ness? 4. Add more shelving on the wall (behind the washer & dryer?). 5. Hang my hacked Ikea shelf. 6. Better organize metal shelving units. 7. Hang brooms/mops/etc. on the wall. 8. Come up with a password for the secret passageway. I can't wait to get started in here! You guys have a great weekend... we're hosting our first fete here at the new casa in honor of my St. Patrick's Day birthday boy. Happy birthday, David!! I can't believe how much you've gotten done in such a short time! Looks incredibly organized! A secret passageway sure is cool! Things are looking great at the new place. Hope you're enjoying it. Please update us on the status of your "old" house when you get a chance! Keeping fingers crossed for you. haha Love both of these rooms! Fantastic storage and organization. I am still working on my house that we moved into in November. I need to get my booty in gear! Haha...hhmmm..Your secret passage way is pretttty cool. ;) If I were there---I would use it. 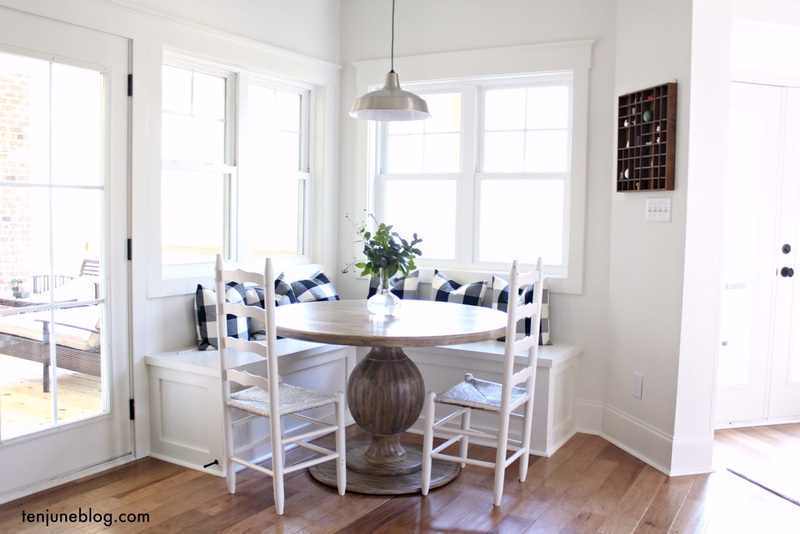 :) Anyways--I do love how you are using your old, old dining room table for folding space. Perfect! Can't wait to see what you do with the space! I love your style and really want to see how you keep storage while still making things look good! We are going to use our old kitchen table for folding in the new house too. Glad to hear it is working well for you! Loving the tour of the new place. Have fun celebrating this weekend! Ummm, secret passages are my favorite, along with a laundry room on the main floor! Love!